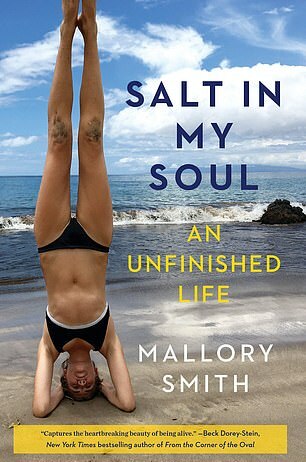 Mallory Smith loved nothing more than the salt water and sea – but it was the excess salt on her skin that was a tell-tale sign of her illness. Because she had two copies of a particular gene, Mallory suffered from cystic fibrosis. The doubled-up gene was responsible for the salty mucus that clogged her lungs, wreaked havoc on her immune system, and left her struggling just to take a breath. For 25 years, she fought the disease, armed with medical advancements. She found relief in and near the sea, whose salt water was gentler on Mallory’s deteriorating, scarred lungs, and where surfing waves was therapeutic to her mental anguish. But ultimately her lungs became infected with a rare superbug. Even the most cutting-edge medicine was too little, too late to save Mallory. She died in November 2017, but left in the wake of her short and challenging life thousands of pages of journal entries – poetic musings on science, survival, love, death and living the fullest life she could. And with those pages were the instructions for her memoir to be published after Mallory was gone. The result is The Salt in My Soul, a moving glimpse into the life of a young woman whose day-to-day might have been dominated by her disease, but who refused to let her life be diminished by it. Grinning in a pink rash guard next to her surfboard and giving the ‘hang loose’ hand-sign, Mallory looks not only healthy but happy and at ease in her body and her world. But just standing there was hard-earned for Mallory. Living and breathing – much less surfing and smiling – meant a daily regimen of at least nine hours of sleep, dozens of pills, breathing treatments, manual extraction of mucus from her airway and carefully calculated meals. And her whole life had to be carefully maintained that way. 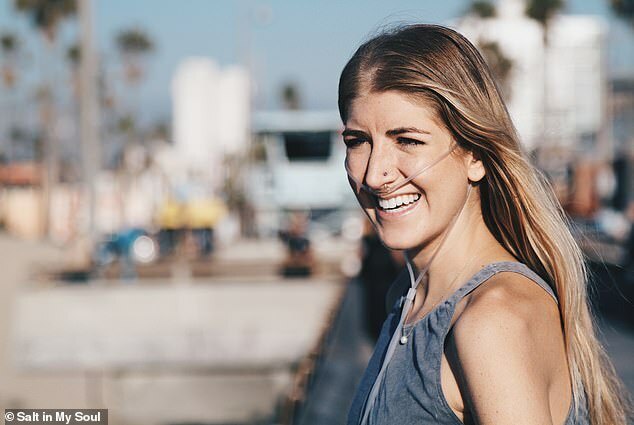 Mallory was diagnosed with cystic fibrosis at age three – around the time she first swam in the ocean near her home in Los Angeles. If they’d known the old adage – which predates scientific understanding of cystic fibrosis – that a baby with salty skin won’t live long, Mallory’s parents, Diane Shader Smith and Mark Smith, might have known their daughter’s life would be cut short from the first time they kissed her. The genetic mutation underlying cystic fibrosis (CF) causes mucus that should be thin and slick to become mucky and thick, and makes the sweat expel more salt than a healthy person’s would. So salty skin is a hallmark of a person with CF (a ‘CF-er’ as Mallory refers to people with the disease), but salt water is also therapeutic to their systems. 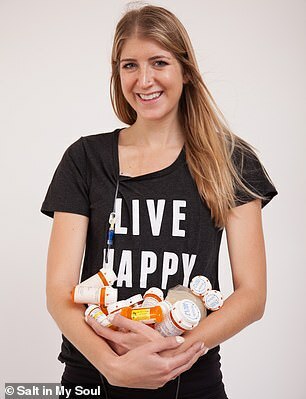 Mallory and her family were acutely aware of her disease and its implications for her longevity, and her mother, Diane, told DailyMail.com that her daughter gave a ninth grade class presentation on why CF kills people – including her – early. ‘She understood her own mortality … she knew early on,’ Diane says. But Mallory didn’t let that stop her from being a varsity athlete in three sports – including swimming – a prom queen and studying biology at Stanford University. While outwardly she thrived, Mallory kept meticulous record of the internal anguish she couldn’t bring herself to talk about aloud in her copious journals. 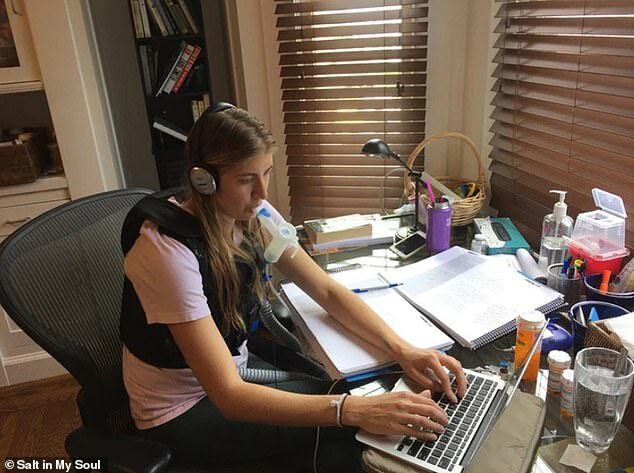 Anguish over the tension between her life ambitions and the reality of illness, over the embarrassing gastrointestinal symptoms of CF, the unfairness of the access to care she had that other CF-ers didn’t, and over the invisibility of her illness. ‘She looked really healthy when she missed weeks and weeks of class, and when she returned, [teachers] would say “you don’t look sick,” and they’d want to punish her,’ Diane recalls. Once at a swim practice, Mallory suddenly scrambled from the pool. ‘They jokingly called her lazy, but she ran into the bathroom to cough up blood,’ Diane says. Like many people with chronic, debilitating, but unobvious diseases, Mallory struggled to decide whether or not, and when, to disclose her illness. Sometimes being up-front was important to protecting herself, while others it seemed keeping her condition a secret was for the best. 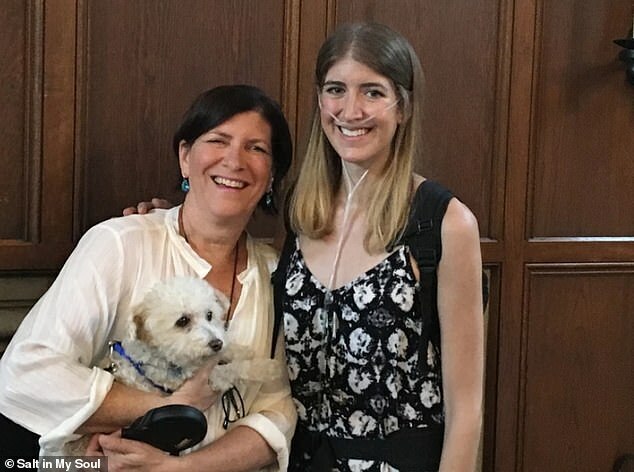 ‘She interviewed for a writing job once, and they said they loved her sample and were going to offer her a job, and I told her she had to tell them she had CF,’ Diane says. But when it came to her boyfriend, Jack, Mallory decided to show all her cards early on. ‘She said, “I want to know if this person who’s there for me when I’m happy and fun and hanging out, if they are there for when I’m sick, too,”‘ Diane says. Mallory shared happy times with Jack, and in her short years even published a book, The Gottlieb Native Garden: A California Love Story, about a fellow environmentalist who started a native plant preservation in Los Angeles. But at 24, the nearly inevitable happened. 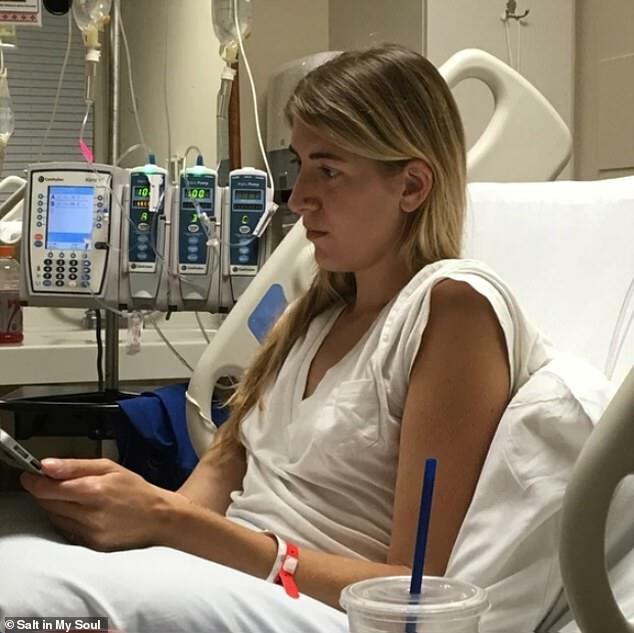 Mallory contracted a lung infection. And not just any lung infection: she had B. cepacia, an already aggressive bacterial infection, which became antibiotic-resistant. With no drug to treat her illness, the prognosis for Mallory was beyond grim. As she was well aware, and sometimes self-conscious about, Mallory was luckier than most. Her parents were well-to-do and well-connected. They got her into the one transplant program in the country that would accept such a high-risk case, the University of Pennsylvania Medical Center. When their insurance company wouldn’t cover the lung transplant, Mark and Diane got in touch with a friend of a friend who was high up at Blue Cross Blue Shield. ‘By pulling strings, we got her approved, and she knew that wouldn’t be the case for the majority of people,’ Diane says. Mallory wanted to d a podcast episode revealing that fact, but her mother begged her to wait until she was better. ‘We have to get you over this, how can you advocate if you’re not here,’ Diane told her. The family trekked to Pittsburgh for the transplant. Mallory got her new lungs, but the superbug wouldn’t stay away. The Smiths scrambled for any hope and made their second desperate plea for Mallory to undergo phage therapy, an experimental treatment that uses modified viruses to attack superbugs. This time, the Navy, which oversees a phage therapy program, accepted and made a drug cocktail for Mallory who, meanwhile, was slipping away quickly. Scientists rushed the preparation of the treatment and flew the phages to Pittsburgh in bad weather to deliver them to Mallory on Thursday, November 14 2017. But it was too late. The next day Mallory succumbed to pneumonia that developed as a complication of the B. cepacia. There was a bittersweet silver lining to her death. An autopsy revealed the phages had indeed been working. Composing herself, Diane says: ‘As it is with everything, they need to study [phages], it’s not anecdotal. Indeed, it wasn’t. The Smith family continues to raise money for phage research – including a portion of the sales of The Salt in My Soul (the remainder goes to cystic fibrosis research or programs that host the book tour). Already, Diane says that phage therapy has saved the lives of two other girls who had cystic fibrosis and superbugs. And that seems fitting of the legacy Mallory hoped to have, as she wrote: ‘I have a strong urge to do something more . . . to write something that will change people, that will have an infectious influence on the way they think and feel that will last. Read an excerpt of Mallory’s writing below. When I was young, I learned about the selfish gene. Lying in bed at night, cuddled beneath the covers, my dad’s voice would soothe me to sleep with talk about the complexity of the human genome, the spiral shape of a DNA helix, the way forces of natural selection would make harmful mutations die out with their host, but allow random beneficial mutations to proliferate and spread through a population, causing such changes within a species that one common ancestor could play grandfather to a bonobo, a rhesus monkey, and a human, or a Brussels sprout, mustard seed, and stalk of broccoli. Every night, as he’d wax poetic about the marvels of evolutionary biology, only taking a break to throw in some astrophysics and history, I’d fall asleep to the letters A, T, C, and G, amazed at this world we live in, developing this profound love for the theory of evolution, for the belief that random chance and probability could shape a planet composed of rock, water, and protozoa into the beautifully varied community of life that exists today, from the highest peaks of the Himalayas to the lush richness of the Amazon to the eerie black depths of the dark ocean floor. We worshipped Dawkins and Dennett, the unusual versions of childhood heroes my brother and I clung to, and they illuminated if not the why, then at least the how of human existence. Evolution seemed like a religion, but it wasn’t one because it does not require faith, it encourages you to question, to dig, literally, to understand the origin of our species and the complex history of the genetic matter that existed, mutated, and evolved to construct this current world of ours. This community of species we share the planet with, a community that has lost members like the dodo, the Kauai o’o bird, the Caribbean monk seal, the Baiji white dolphin. But one day, I realized that evolution, the almighty natural force that I revered with the core of my being . . . evolution isn’t acting on me. If natural selection were happening unhindered, I would be dead. There would be no Mallory Smith, age twenty-two, Stanford graduate living and breathing, making friends and reflecting on the origins of the universe. There would just be some ashes scattered in the Pacific Ocean, or however my family would choose to honor a life that had no chance to ripen. At this point, keeping myself alive is a full-fledged mission, enlisting all of my energy and hours of my day, every day, as I need nine to ten hours of sleep, sixteen pills with a hearty breakfast, packing extra calories to overcome malnutrition caused by pancreatic insufficiency. Vitamins and minerals, probiotics and antibiotics, gastrointestinal medications, sinus rinses with saline, steroids and antibiotics, lengthy CPT treatments. All to reduce inflammation and fight the chronic deadly infection eating away at my fragile, scarred lungs. And that’s just the morning. Throughout the day, more pills four times a day. Some three times a day, some every time I eat, some thirty minutes before eating. Another round of CPT/vest midday, more breathing treatments. Then the entire morning routine again at night. About four hours a day I dedicate to the simple act of taking a breath, fighting the billions of bacteria overtaking my lungs and clearing out the mucus so I don’t feel like I’m breathing through a straw with a boulder weighing on my chest. What does my survival come down to, what is responsible for my ability to trump natural selection? Medicine. Medicine gives me the gift of life. Medicine exempts me from the forces that paved the way for humanity to emerge, that shaped life on Earth for millions of years, since the very first cell sprung to life in the primordial soup. How is that fair? Why do we, today, get to override evolution? What will that do for the future of our species? More important, what does that mean for the millions of other species on this planet who don’t have that unfair advantage, who still exist at evolution’s mercy? I want to live and I want people the world over affected with illness, ridden with deadly diseases, to live, to survive, to thrive, and to reproduce, creating imperfect little perfects. I want us to be viewed as worthy enough to pass on our genes, even if we’d be outcompeted by those whose genome is “better” in a world where natural selection still reigned supreme. My life is a miracle. Life in general is a miracle. Our existence is the result of stars exploding, solar systems forming, our Earth having an environment hospitable to life, and then, finally, millions of highly improbable events accumulating over millions of years to bring us, a capable and conscious bag of stardust, to the here and now.